Wilkie D. Ferguson, Jr. Bar Association - Hon. Wilkie D. Ferguson, Jr. The Honorable Wilkie D. Ferguson, Jr. was born in 1938 to Bahamian immigrants and raised in Miami’s Liberty Square public housing project. He attended segregated public schools and graduated in the first graduating class of Northwestern High School in 1956. He received his bachelor’s degree in business administration from Florida A&M College, where he met his wife, Betty, who later became a Miami-Dade County commissioner. After graduating from college, Judge Ferguson enlisted in the Army, attaining the rank of second lieutenant. He served as a paratrooper and infantry officer at Fort Benning, Georgia in 1961. Following his discharge from active duty, he worked as an accountant in Philadelphia, took graduate courses at Drexel University and then enrolled at Howard University School of Law. He served as associate editor of the Barrister and received his Juris Doctor degree in 1968. Throughout his college and law school years, he continued to serve as an Army Reserve officer and was promoted to captain. Returning to Miami after law school, he was appointed to a presidential panel that investigated the 1968 Liberty City riots. His legal career before taking the bench included working at the Liberty City-Brownsville Legal Services office from 1969 to 1971. In 1971, he became one of the co-founders of the law firm McCrary, Ferguson and Lee. His practice included serving for two years as an assistant school board attorney. In 1973, Judge Ferguson was appointed to the Court of Industrial Claims. In 1976 Governor Askew elevated him to the Circuit Court bench. He was the first African-American to be appointed to the Dade County Circuit Court. As a trial judge, he made a landmark ruling precluding the systematic exclusion of blacks from juries. That ruling led to important appellate decisions recognizing the impropriety of such discrimination in the court system. Judge Ferguson was appointed to the Third District in December 1980, the first African-American judge to serve on the Court. He was retained in successive elections until President Clinton nominated him to the federal bench in 1993. While serving as a United States District Court judge, he rendered decisions that led to substantial increases in funding and services for disabled Floridians. Judge Ferguson’s activities included chairing the Board of Trustees at Florida Memorial College. He was active in the Judicial Council of the National Bar Association, a black lawyers’ association, and the Just the Beginning Foundation, a professional fraternity of black federal judges. His many awards and honors include the Distinguished Service Award from the South Florida Chapter of the American Society for Public Administration, the United Way of Dade County’s Leadership Award and the Outstanding Jurist Award from the National Bar Association. He participated in the American Inn of Court at St. Thomas University Law School and was appointed to the Florida Supreme Court Committee on Standard Jury Instructions in Civil Cases. Judge Ferguson died on June 9, 2003. 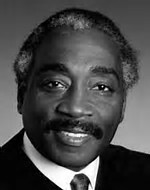 At its annual meeting on June 19, 2003, the general membership of the Black Lawyers Association voted unanimously to rename itself the Wilkie D. Ferguson, Jr. Bar Association. The federal courthouse in downtown Miami has been named in honor of Judge Ferguson.